Every web developer has their way of properly testing their websites so they operate in the popular browsers and platforms. I have an effective one computer solution that has been tried and true for me, for years now. PC: Firefox: IE7, IE8, Chrome, Opera. Everyone knows that to get a TRUE IE check you should have a native install. What i have done is created two virtual machines with Parallels but the trick that i have found is that you only need one Windows serial/disk. 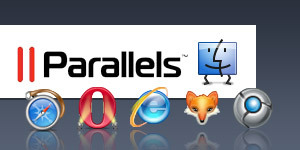 Windows will allow you to install as many instances of itself on one Parallels machine. This makes it great for me, I created one machine for IE7 only (just a short while back i also had another one for IE6 but I have recently dropped it from my QA testing) and another one that does the rest of the PC browsers, FireFox, IE8, Chrome and Opera. I design and develop on the mac and start testing with Firefox and Safari then jump over to each virtual machine to check that the code that i am doing is working the same. I do this progressively throughout each project doing small chunks of the site and testing as I go to make sure i dont get too far ahead with some buggy code. Hope this makes it easier for your website testings.